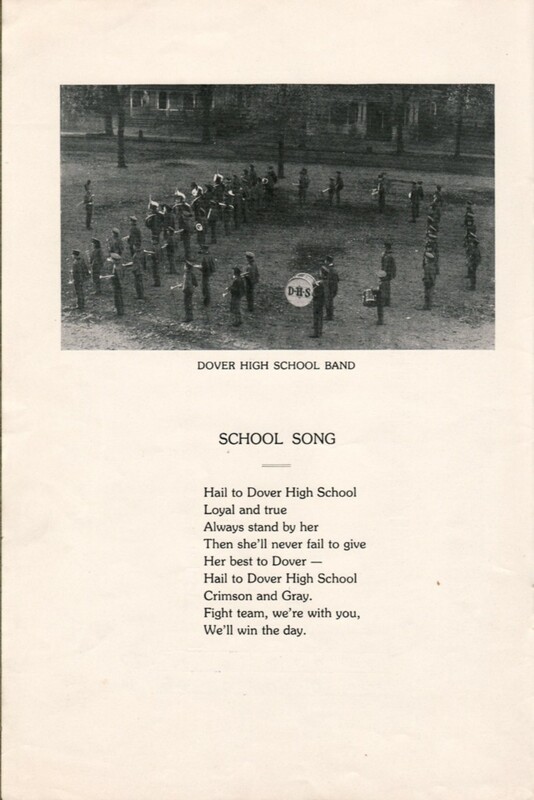 The 1931 Dover squad was the finest the high school had assembled to that point. In Coach Hermann Rearick's rookie season, the gridders amassed a record of 10-1, defeated staunch foes Millersburg, Massillon and New Phila, sent two starters to the all-conference and All-Ohio first team, and boasted the area's high scorer in halfback Don Foutz. 1931 Dover Football | What Happened Next? Like all the chapters and epochs of a life, major and minor, every football season eventually sees its end. It’s been a joy for me, some 79 years after the fact, to record and in the historical sense, relive the struggles and triumphs of a magical Dover football season. 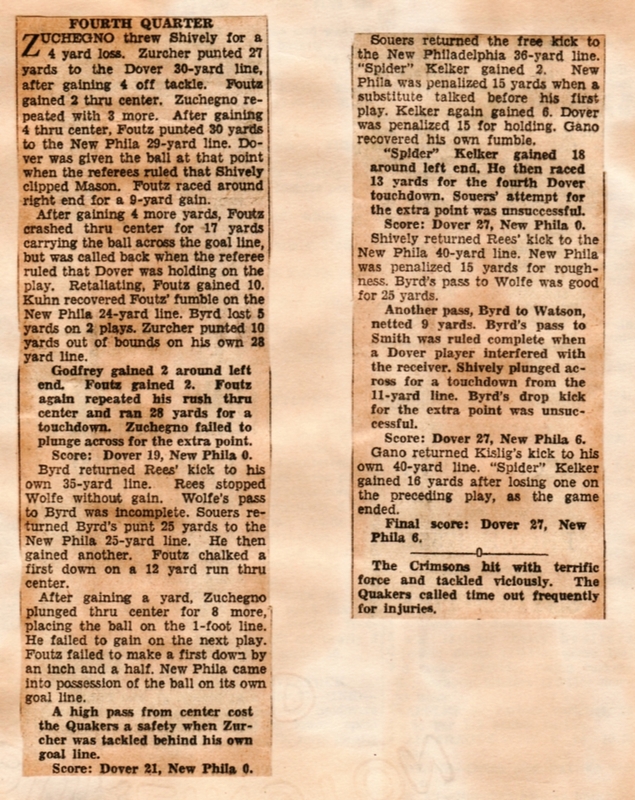 Week by week, as I posted the game exploits of my grandpa, Don Foutz, and his 1931 teammates, the games, as well as the lives behind the names in the boxscores, became real to me. There’s something to delayed gratification, I guess. The pacing in fitting a long-ago story with the calendar you’re living through today, that achieves a certain mystical synchronicity, the effect of long-gone souls coming alive for a time before your eyes, and matching you breath for breath. All that aside, there are still stories to tell you. My goal was to relate them in tandem with the 2010 Tornadoes season. Another bit of happy circumstance is that even as I endeavor to keep the 1931 team alive and rambling before us, the 2010 squad plays on, against Sheridan Saturday night in Round 2 of the Ohio high school football playoffs. May their story continue as I wrap up this saga of the 1931 Dover Crimsons. Imagine, for a moment, that Dover football had only existed since 1980. That’s actually a useful point of reference for understanding the 1931 team and its relation to previous Crimsons seasons. Dover football began in 1896, and didn’t achieve anything like regularity until the early 1900s. You could argue that until 1931, Dover had only enjoyed one truly remarkable run. 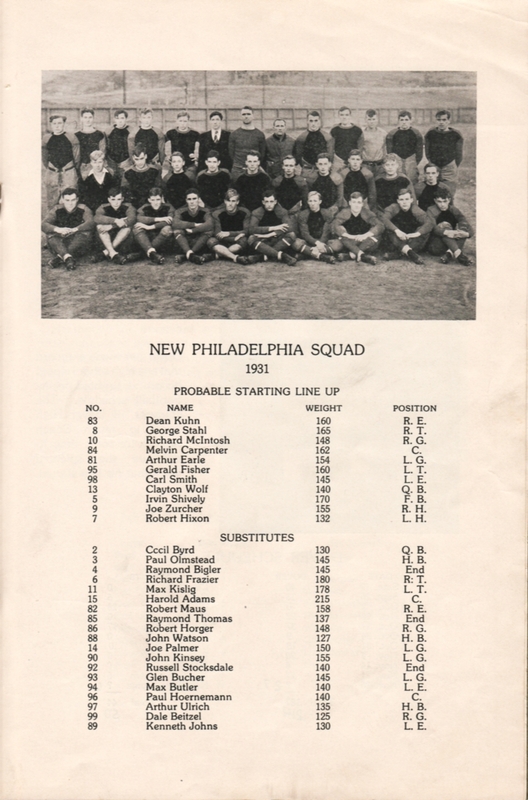 The 1926 squad, quarterbacked by eventual 1931 coach Hermann Rearick, was first to finish undefeated, racking up 7 wins, salvaging ties against Wellsville and arch-rival New Phila, and losing none. For Dover, then, 1931 stood in bold, 32-point font. Think of all that had been accomplished, and for the first time: 10 wins. Victories over previously-unbeaten and unscored-upon Millersburg. First win since 1908 against Massillon. A second-straight victory over New Phila. Fewest points allowed in a season, with 50. Six defensive shutouts. School single-game records for rushing yards and PATs. Most safeties recorded in a season, with 3. A #5 state ranking. And yet, for all Dover had accomplished in this dream 1931 season, it was just the curtain-raiser on a three-year run of dominance. 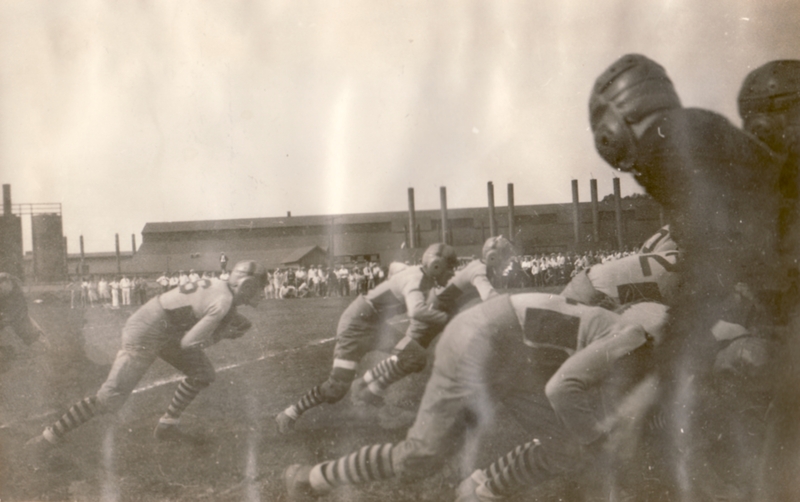 The 1932 and ’33 squads, led by the brilliant rushing of Frank “Doc” Kelker, would not lose a single game. That’s two straight seasons of 10-0 ball, three straight 10-win autumns. The feat has remained unequaled in the nearly 80 years since. 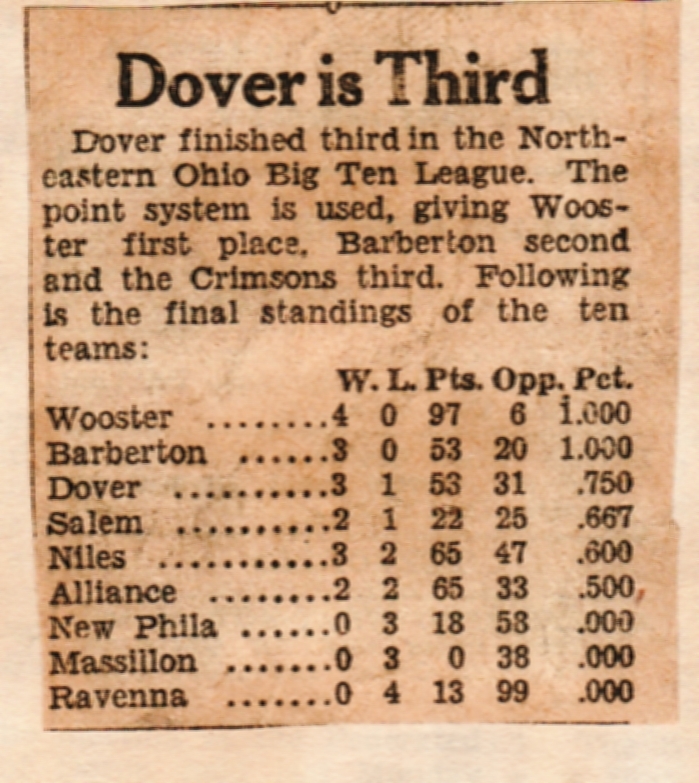 Into 1934, Dover would notch 29 straight victories. They would so thoroughly defeat Paul Brown’s Massillon Tigers the upstart coach — and eventual legend — refused to schedule Dover, even as his own squad went on to six straight state titles, and a few seasons of recognition as the nation’s best. As for Dover’s 11, they would notch four straight victories against the crosstown Quakers. 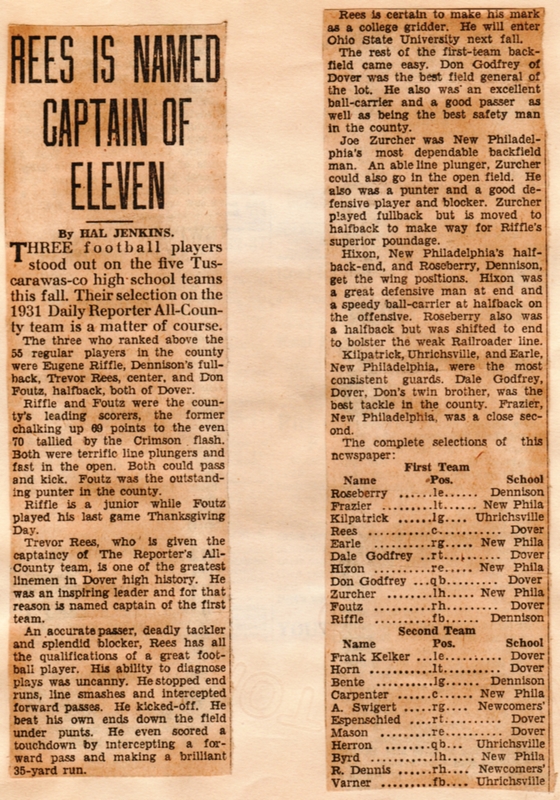 And, contrary to what was written in the Times-Reporter this week, Doc Kelker, as senior on the 1933 squad, and any graduating 1934 senior who saw action as a freshman in 1930, would belong to a class that won 34 games in four years. This year’s Tornadoes, according to the T-R, have won 31 through their first round victory over Steubenville, placing them at the pinnacle, I am guessing, for three-year Dover football records. May they win many more. My point? 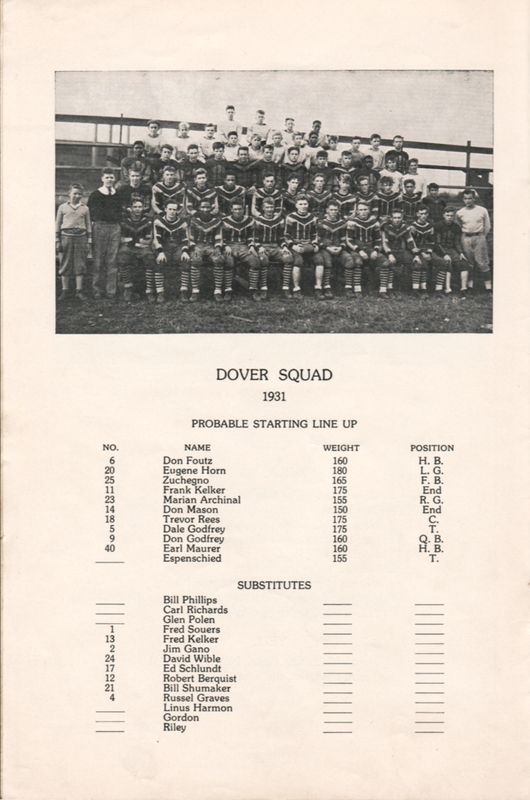 The early 1930s Dover teams, beginning with their 1931 romp through the schedule, set a standard that arguably has gone unequaled in the all the decades since. 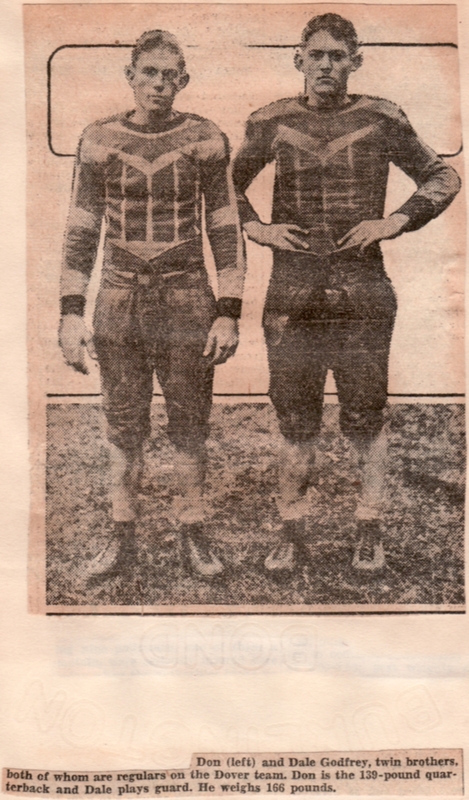 Later in that decade, the Crimsons would earn their lasting nickname when, after an 87-0 rout of Uhrichsville, a newspaper article referred to the “Crimson Tornado of the gridiron” (thanks to Denny Rubright’s Dover football history books for this info and much more), and in 1937 they would build their iconic red-brick stadium just off of Crater Avenue. 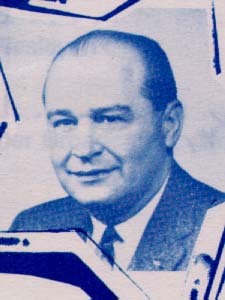 Coach Herman Rearick would receive dual inductions into Ohio’s coaching Hall of Fame for his leadership of football and basketball squads at Dover and Canton McKinley. At the helm of the 1931 Dover Crimsons and their brilliant successors was a 22-year-old coach. What’s that saying: “you can’t go home again?” Well, Herman Rearick, in his first job since graduating from Wittenberg College, did just that. And brilliantly. 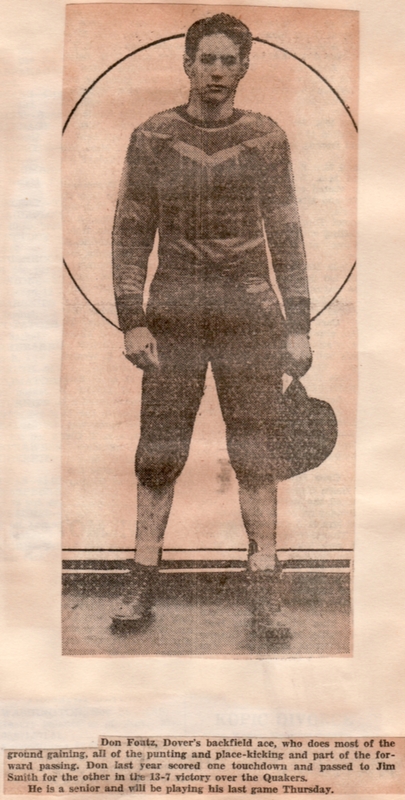 Rearick had been the boy wonder who only five years prior had quarterbacked the Crimsons to an undefeated 1926 season. As encore, he led the 1926-27 basketball team to Dover’s first state championship. Oh yeah, and he was something of a baseball player, too, winning 11 games and losing just 1 as shortstop on the Dover nine. After their glorious football autumn, Bup relied on many of the same athletic cast to post an 8-14 basketball season and 12-3 record in baseball. 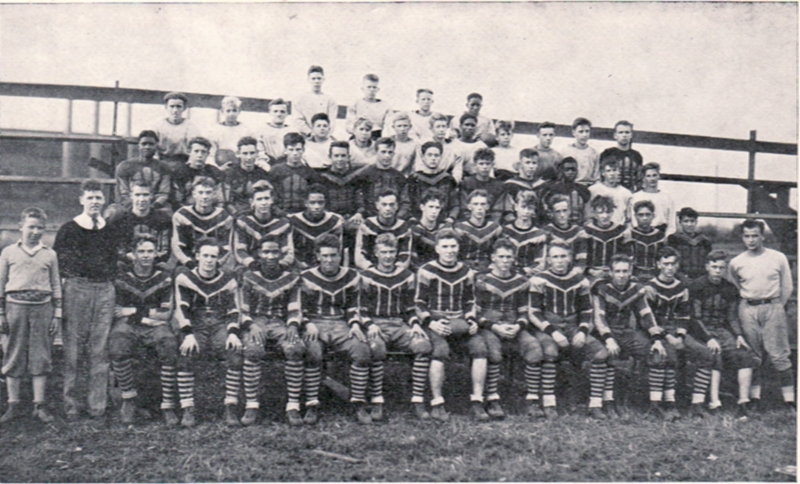 The following year, Rearick’s 1932 football squad went 10-0 and allowed just two touchdowns all fall. In basketball, for the 1932-33 squad the total tally was 16 wins, 4 losses and Dover’s second state championship. Rearick remained coach at Dover through 1938, recording another 10-0 season in 1933 and posting just one losing football autumn, and leading his cagers to runner-up status in the 1936-37 state basketball final. Rearick was hired by Canton McKinley in fall 1938, and there his excellence played out for a new legion of high school fans. He won state championships in football in 1942 and ’44, and ended his football coaching career with an all-time winning percentage of 85%. In basketball, his Bulldogs squads became regulars in the state tournament, making the Sweet 16 eight times between 1940 and 1961, finishing 2nd in 1940, ’43 and ’46, and reaching the semifinals in 1945 and ’54. He won 77% of his games as basketball coach, earning him induction into the Ohio High School Basketball Hall of Fame in 1988. He was inducted into the Ohio football coaches’ hall of fame in 1971, and also boasts enshrinement at Wittenberg, Canton McKinley, Dover and the national collegiate football Hall of Fame at Rutgers University. Trevor Rees, Center, Crimsons. He anchored the powerful Crimsons offense, and broke Akron North's spirit on defense by scoring on a 30-yard interception return. 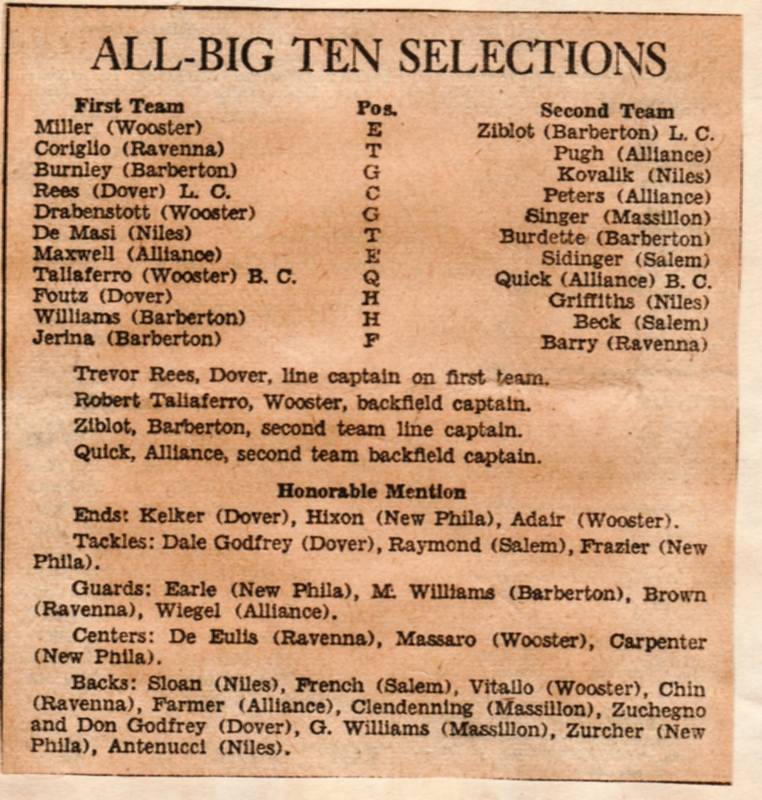 The 1931 Dover Crimsons squad boasted talent enough to spare for the school’s undefeated 1932 and ’33 rosters. But let’s start with the departing seniors, shall we? Center Trevor Rees and halfback Don Foutz were named to the first team of every season-ending honors squad that mattered: the Dover Daily Reporter All-County Squad, the Northeastern Ohio Big Ten League all-conference team, and that highest of high school heights, All-Ohio. Rees was recognized by the Daily Reporter as “one of the greatest linemen in Dover high history.” His “inspiring leadership” lifted his teammates to stellar effort, and his wily play on both offense and defense kept opponents on their heels. A newspaper headline later that year broadcast, to no one’s surprise, “Trev Rees Receives State Football Call”. He continued his career at Ohio State, where he made All-American in 1936. He coached at the high school level at Cleveland’s Shaw High School, where he was 32-10-1, and was on the coaching staff at Ohio State in the early 1940s under Paul Brown. Beginning in 1946, Rees was athletic director and head football coach at Kent State University for 18 years, notching a 92-63-5 record. He was named to Dover’s athletic Hall of Fame in the inaugural 2010 class. As a Dover halfback and punter, Foutz was known for his booming kicks — he averaged over 43 yards a punt for his three-year career — and his breathtaking open-field speed. He was equally adept at plunging through the holes Rees opened in the line, and in 1931 he posted two school-record marks for rushing in a single game, with 209 against Uhrichsville and 220 against New Philadelphia. These records would stand for more than 60 years. He was recruited by Ohio State a remarkable four years after his graduation. In tomorrow’s post, I’ll trace Don Foutz’s post-high-school life on the gridiron and off, in commemoration of the 30th anniversary of his death, Nov. 14, 1980. Among underclassmen on the 1931 Dover Crimsons, twins Don and Dale Godfrey would also go on to ply their trade at The Ohio State University. Don quarterbacked the 1930-1932 squads, taking over more and more of the passing duties from the versatile Don Foutz in his junior season. In leading the 10-0 1932 squad, senior Don Godfrey threw for 9 touchdowns (cementing an all-star combination with end Doc Kelker), ran for 4 and also took 8 PATs over the line. He went on to play for Ohio State. Dale played tackle and was captain of the 1932 team. He was all-conference all-star, and played alongside his brother in college as a Buckeye. Frank “Doc” Kelker is universally recognized as the greatest athlete to ever come out of Dover High School. He earned 11 varsity letters. Went 30-1 in his his sophomore, junior and senior seasons in football. Was a member of the 1933 state championship basketball team. Helped the baseball squad to a 23-4 record his junior and senior seasons. Set a school record — that still stands — in the 100-yard dash, running it in 9.9 seconds, as a freshman. Kelker continued his multi-sport stardom at Western Reserve College in Cleveland, where he was named All-American and in 1962 was chosen for the 25th Anniversary team — for all of college football. He went on to coach at Cleveland Central High School before devoting himself to the YMCA, for whom he eventually oversaw all of Cleveland’s urban YMCA branches. In addition, as an African-American player in an era where even the Big Ten fielded only all-white squads in basketball, and in which he faced taunts from fans and outright assault from opposing players, Kelker held himself to a higher standard, and lived an exemplary life. He was inducted in Dover’s inaugural athletic hall of fame class. COMING TOMORROW: A look at the life of 1931 star Don Foutz after his high school playing days ended. Each week, this series runs in tandem with the 2010 Dover (Ohio) Tornadoes football schedule to share historic game-by-game summaries of Dover’s 1931 season, in which Colt Foutz’s grandfather, Don Foutz, played a starring role. Game stories and photos are excerpted from Don Foutz’s football scrapbook, with thanks to Fred Foutz. How did Dover do this week (in 2010)? Get the latest Dover Tornadoes news from the Sports section of The Times-Reporter. The Crimsons struck with full power yesterday to score the most decisive victory in history over New Philadelphia. Backs who knifed through holes opened by a great line and skirted ends behind an army of interference swept Dover to a 27-6 triumph. Close to 5,000 saw the magnificent exhibition of sheer power; watched what was to have been a close conflict turn into a rout of the Quakers. For 17 years Dover fans had waited for yesterday. And few you will find who’ll not say that this Crimsons team of 1931 — the first coached by Herman Rearick — is one of the greatest aggregations in local football history. Result: Dover 27, New Philadelphia 6. Dover finishes the season a record 10-1; Phila falls to 4-6 (after starting 3-0). Notable: The game marked the most points Dover had ever scored against their rival (previous high was 18) in 25 total contests, and the biggest margin of victory for the Crimsons at 21 points. Also Notable: Dover rolled up 402 yards — a record 220 of them gained on the ground by Foutz (a school rushing mark that would stand for 64 years) to a mere 71 total yards by the Quakers. Notable as well: The bleachers were filled almost an hour before the 2:30 start time. For a game played so late in the year, the weather was clear and cold, the field muddy. Dover’s uniform was white shirts, white pants, white headgear — black numbers. Make note of this, too: As noted earlier in 1931 game coverage, this was the first Dover-Phila contest to feature a play-by-play via public address system. But the screaming of the faithful — as well as the cannon some young Crimsons fans brought with them — rendered the effort mostly useless. By game time the crowd had been whipped into a frenzy by a week’s worth of anticipation — light standards in downtown Dover bedecked in crimson and gray; a steak-and-potato dinner served at noon for the team, courtesy of the Lion’s Club; the high school band spelling out “Dover” during pre-game and tossing confetti from the formation. Fifteen police patrolled the field, but the only note of an unruly fan being tossed came when one “funster” tossed a fish from the Dover side. Keys to the game – Dover dominated every phase of the game, and only allowed a touchdown in the closing quarter. The Crimsons notched 23 first downs to the Quakers’ 6. As noted above, Dover netted almost 600% more yards from scrimmage than their hapless rival. New Phila found momentum early on from its passing attack — playing off a strategy that began to work in the fourth quarter of the 1930 game before the Quakers ran out of time. But even this strategy faltered. In all, the Quakers were just 6 of 12 passing for 82 yards with one of those attempts intercepted by the Crimsons. Meanwhile, Dover simply ran the ball down New Phila’s throats. Foutz’s record 220 yards were accompanied by 2 touchdowns. Zuchegno gained 78; Fred Kelker 55; Don Godfrey 32; Frank Kelker 11; and Mason 6. On defense, Dover blocked a field goal to end Phila’s best chance of scoring, on the opening drive. In the second half, the Crimsons caught Phila behind the line of scrimmage in their own end zone and scored a safety. In all, it was the usual spirited, manic play characteristic of the rivalry game. Kicks missed. Penalties called back touchdowns. Fumbles occurred within striking distance of the goal. Rushers were stopped short of extra-point yardage. The final score might have been even more for Dover, or Phila could have put themselves closer. But the dominance of the Crimsons proved it: on this day, Dover would not be denied. “After gaining 4 more yards, Foutz crashed through center for 17 yards carrying the ball across the goal line, but was called back when the referee ruled that Dover was holding on the play. Retaliating, Foutz gained 10. Kuhn recovered Foutz’s fumble on the New Phila 24. Byrd lost 5 yards on the 2 plays. Zurcher punted (for Phila) 10 yards out of bounds on his own 28. Top performers – Touchdowns went to Foutz (2), Zuchegno and Fred Kelker. The defense scored a safety in the fourth quarter, and only allowed the Quakers to score on the next to last possession of the game. NEXT WEEK: What happened to the 1931 Crimsons after their magical 10-1 season was ended? Stay tuned as Colt profiles the team’s stars and what they did next. 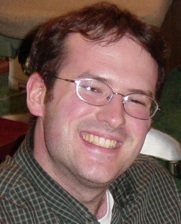 In his high school career, Don Foutz provided the crucial points in six Dover victories. But he had to wonder, on the eve of the 1931 grudge match with New Phila, whether he could again rise to the heroics that carried Dover to victory the previous season. Today, and for the last several decades, the annual Dover-Phila game has been the pinnacle of a week-long buildup of student body dress-up days, pep rallies, parades, bonfires and general community merriment run amok. Even if you knew nothing of the game, and could care less about the outcome, it would be hard not to get caught up in the sweep of emotions attending the biggest contest of the season, and for the vast majority of the players about to take the field, the biggest contest of their playing careers up to that point. 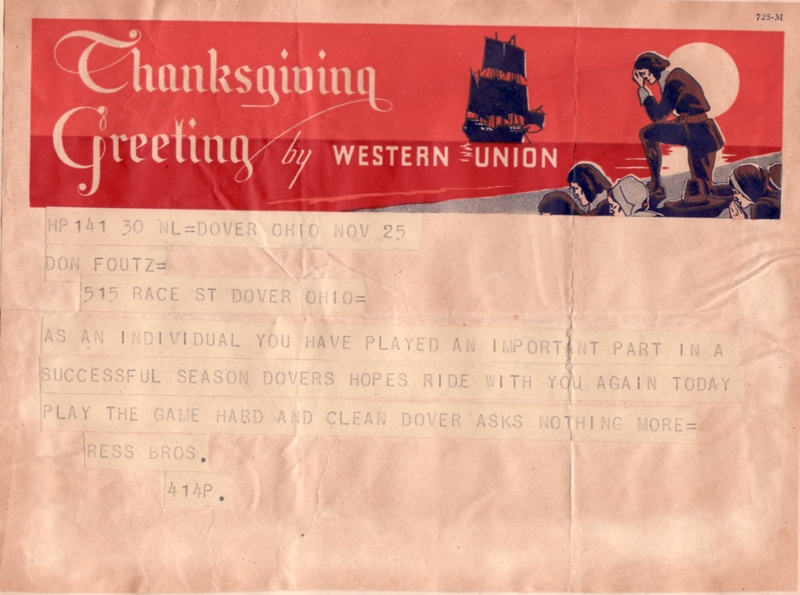 My grandfather, Don Foutz, was well-acquainted with crucial games in his four years of Dover football. 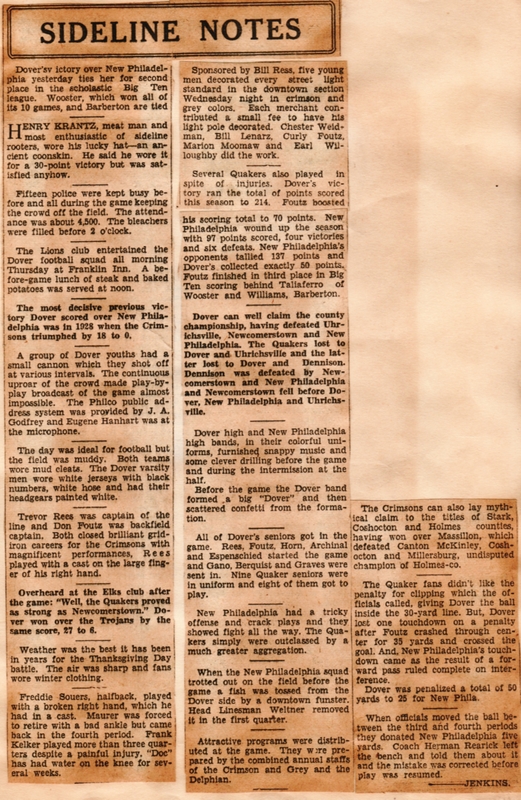 Dover’s 1930 win over rival New Phila came after the Quakers had shut out the Crimsons 7-0 in 1929. Foutz, a sophomore in that contest, booted a 60-yard punt in a losing effort. The finale of his junior season saw him outgain the entire opposing side with 110 yards, score the game-tying touchdown, and still almost see it go for naught. Only his 35-yard heave and receiver Jim Smith’s 12-yard scamper after the catch into the end zone saved the day for the Crimsons. And now a telegram. At 4:14 the afternoon before Thanksgiving, 1931. From the “Ress” brothers, whose identities are lost to history (or at least not known to me). However well-intentioned, it gave Don Foutz a lot to ponder on the eve of the biggest — and final — game of his high school days. How would Foutz rise to the occasion? How could he hope to top his heroics of 1930? Only by recording the greatest single-game rushing performance in school history. Coming Tomorrow – The Big Game. 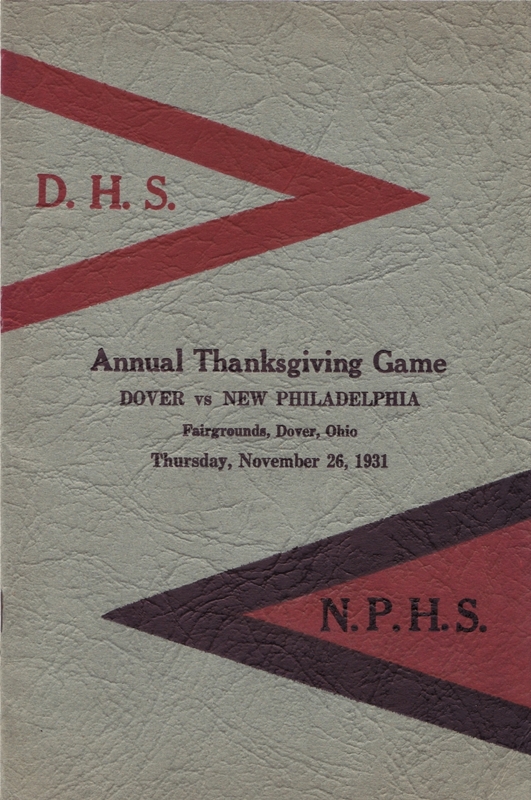 The first page of the 1931 Dover-Phila game program trumpets the arrival of the 20th annual Thanksgiving Day contest. One has to assume the combined editorial staffs of the Crimson and Gray and The Delphian had done their research. And so, counting backward brings us to the first Dover-Phila game, played on Thanksgiving, 1897. But there were 5 earlier-season matches between the rivals played as well. And as a rule, few had gone particularly well for Dover. In the early years of the rivalry, according to the 1931 game program, Dover squared off against New Phila just six times between 1897 and the first of two matchups in 1914 between the schools. 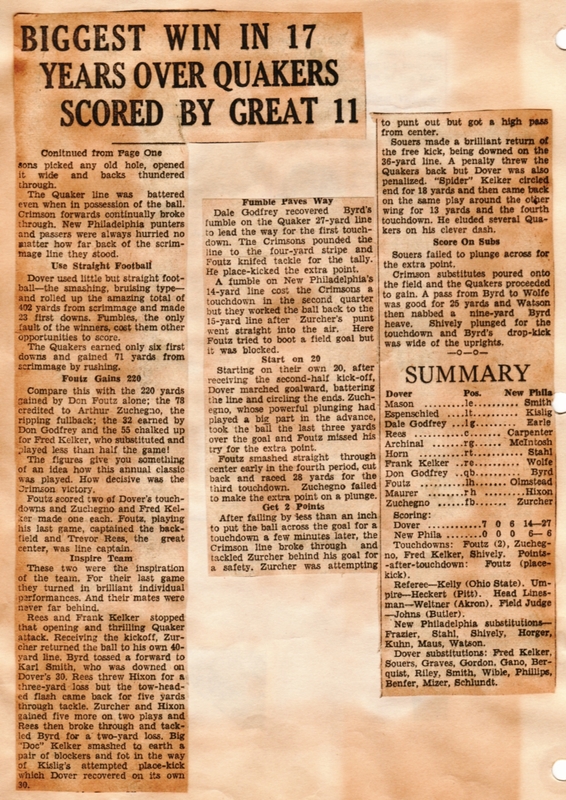 It may have been well for Dover to cry off at that point, when the series stood with Dover in favor 2-1-3 even though Phila had notched a 23-21 advantage in total scoring. Because the next two decades would mostly be a downer. From the Thanksgiving games of 1914 through 1921 the Quakers amassed an 8-1 record over the hapless Crimsons. 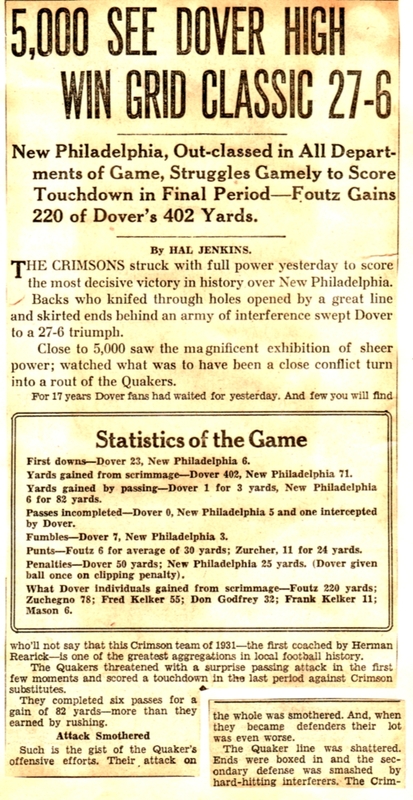 Phila rolled up 240 points to just 14 scored by Dover, which found itself on the wrong end of 27-0, 39-0, 42-0, 61-0 and 47-0 blowouts, broken only by its 7-0 triumph in 1916. In 1917 alone, the Quakers scored 108 unanswered points (in two games). 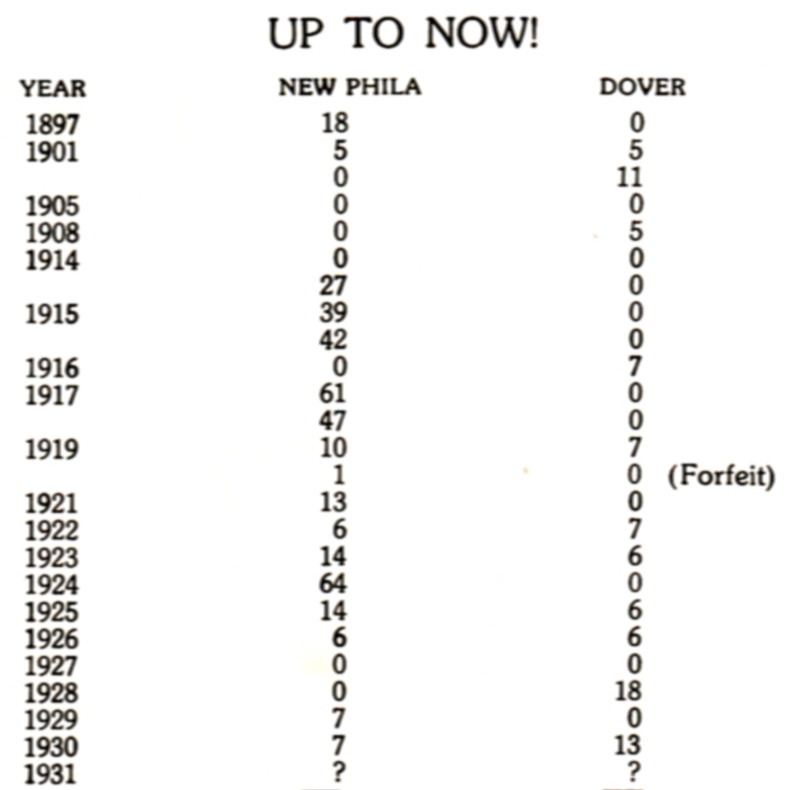 From 1922 through 1930, though New Phila still outscored its rival 118-56 (mainly attributable to a 64-0 win in 1924), Dover eked out a 3-4-2 record. Though they had suffered the record margin of defeat in 1924, the Crimsons had also pulled some heady upsets and a crafty tie to preserve their undefeated 7-0-2 record in 1926. If Dover could pull out a repeat of 1930’s late-game heroics, it could pull even for the decade of 1922-1931 at 4-4-2. Of course, that would still put the Crimsons behind 7-13-5 in the overall series, coming off a point deficit of 381-91. But hey, they had the next 80 years to make up that ground. Of course, the yearbook accounting below didn’t record at least two other early games found by Rubright, both Dover losses, including a 54-0 blowout. But not to worry, Crimson Tornadoes fans — they’d finally pull even in 2007. 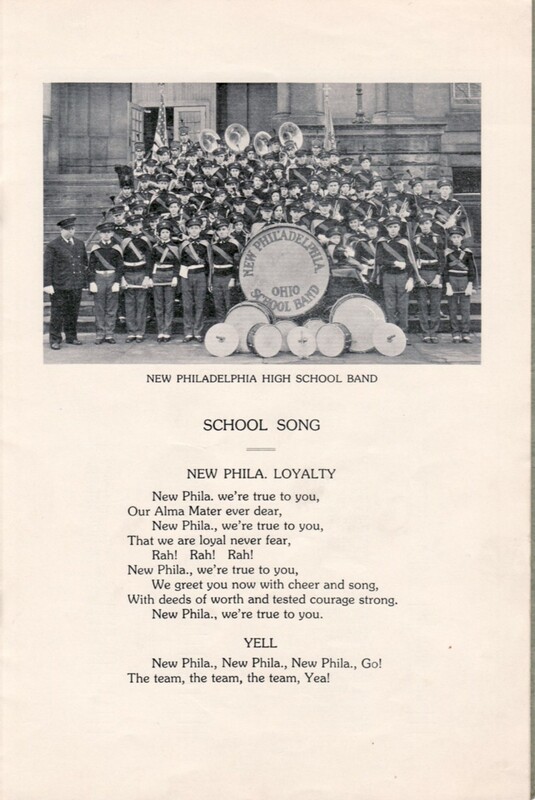 In other matters germane to previewing the game, the yearbook staffers introduced both bands, and the alma maters and fight songs as they were sung, circa 1931. And dutifully reported the rosters of both squads. 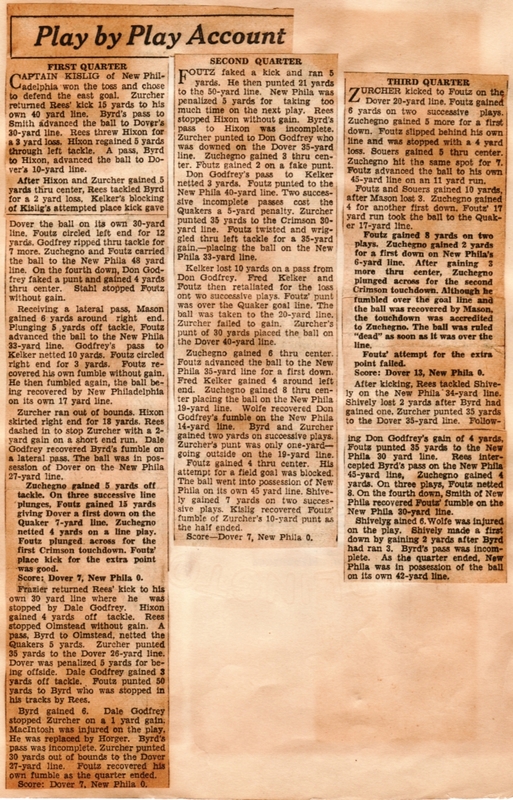 Click on the thumbnails below to catch up on all that’s fit to print about Dover vs. Phila, 1931. Tomorrow: A pre-game telegram puts the pressure on Don Foutz.